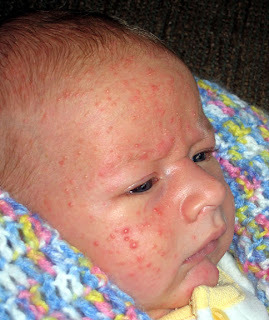 Dr. Nabong's Pediatric Blog: My baby has ACNE! This usually appears after a few days after birth. You will notice small papules usually on the nose, cheeks of full term infants. This is a normal response to mother's hormones which stimulate the glands on the face. You do not have to do anything because this resolves spontaneously by 4 to 6 months of age. Just clean face with plain water. Do not put any lotions, soaps on the area. This might just irritate your baby's face.